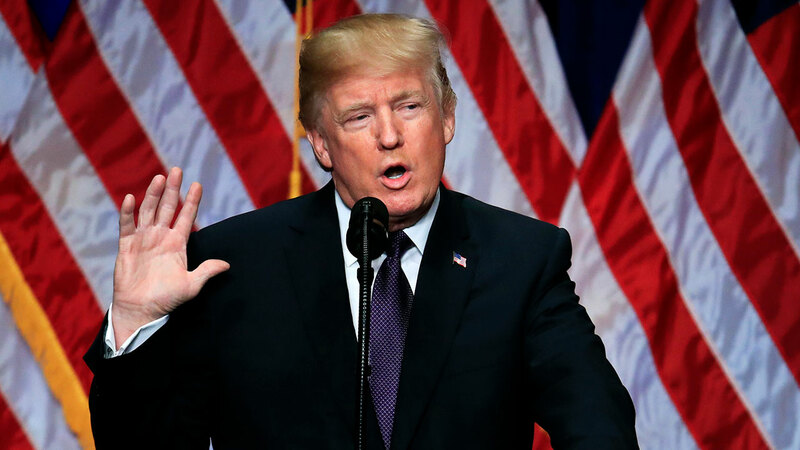 WASHINGTON -- President Donald Trump declared a new national security strategy on Monday, stressing the "America first" message of his 2016 campaign and faulting previous U.S. leaders for failing to measure up to it and look out for the nation's citizens. "Our leaders engaged in nation building abroad while they failed to build up and replenish our nation at home," he said, pointing to the economy's strong performance and predicting even better under his policies. His security strategy envisions nations in constant competition, reverses Obama-era warnings on climate change and affirms that the United States will unilaterally defend its sovereignty, even if that means risking existing the agreements with other countries that have dominated the United States' foreign policy since the Cold War. Trump's doctrine holds that nation-states are in perpetual competition and that the U.S. must fight on all fronts to protect and defend its sovereignty from friend and foe alike. While the administration often says that "America First" does not mean "America Alone," the national security strategy makes clear that the United States will stand up for itself even if that means acting unilaterally or alienating others on issues such as trade, climate change and immigration. The last such strategy document, prepared by President Barack Obama in 2015, declared climate change an "urgent and growing threat to our national security." The Trump plan removes that determination - following the administration's threat to pull out of the Paris climate accord. The strategy sets a goal of being an "energy-dominant nation" and says that the United States "recognizes the importance of environmental stewardship." Despite the risk of potential isolation presented by Trump's strategy, its fundamentals are not a surprise. The strategy emphasizes that U.S. economic security is national security. And it stresses that the U.S. is interested only in relationships with other countries, including in alliances such as NATO, that are fair and reciprocal. Despite international challenges, the document cites emerging opportunities to advance American interests in the Middle East. "Some of our partners are working together to reject radical ideologies and key leaders are calling for a rejection of Islamist extremism and violence," it says. "Encouraging political stability and sustainable prosperity would contribute to dampening the conditions that fuel sectarian grievances." The strategy document also notes that "actors such as Russia are using information tools in an attempt to undermine the legitimacy of democracies." Associated Press writers Matthew Lee and Zeke Miller contributed to this report.